If you watch the videos of U.S. airstrikes on ISIS, it appears were are going out of our way to not kill very many of them. We are mostly attacking empty buildings, empty vehicles and storage tanks. That's not working. The Islamic State continues its offensive to consolidate control of Iraq’s Anbar province. Today, the jihadist group is reported to have taken control of the town of Hit and has launched assaults on the Anbar Operations Command north of Ramadi and the 7th Division headquarters at Al Asad Airbase in Al Baghdadi. “Ninety percent of Hit has been overrun by militants,” a member of the Anbar provincial council told Reuters. Witnesses stated that “scores” of heavily armed fighters are patrolling the town and the Islamic State’s black flag is flying over several government buildings, including the mayor’s office and the police station. Sporadic fighting between Islamic State fighters and the local Albu Nimr tribe has also been reported. 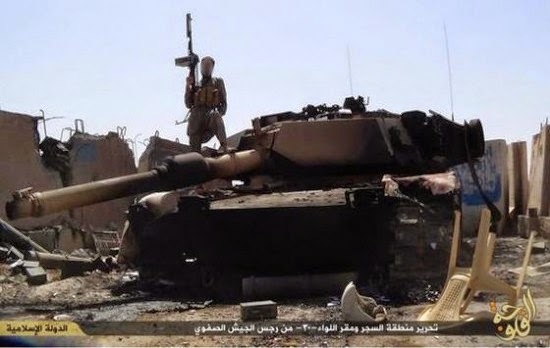 The Islamic State captured “a battalion of tanks, the headquarters of the Infantry Regiment, the headquarters for the leadership of the border guards of the Fourth Region, the Police Department of Hit and 5 police stations in the district,” NINA reported. At least 24 soldiers are said to have been killed and “dozens” more are missing.